The Princeton offense has essentially two sets: "high" and "low". The offense also has two lesser sets: "open", and top flare situations. In "low" and "high", the post's position determines which set is run. Top flare situations and "open" act as bridges between sets. "Low" is shown here. This set usually begins each possession. In this set, the guards are high and are one step outside the lane-line extended. The off-guard stays one step behind the guard with the ball. 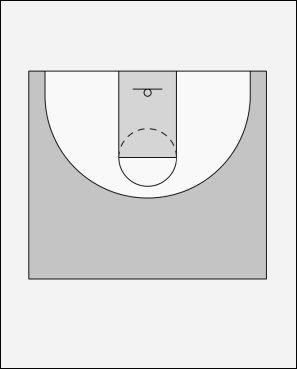 The wings are free-throw line extended and are one step from the sideline. The post is in the midpost. In "high", the post has moved from the midpost to the ballside elbow. The spacing and positions of the other four players remains the same. "Open" acts as a bridge between sets and usually occurs as a result of a top-flare situation, if the man using the flare cuts to the basket. In a top-flare situation, a back-cutting, or flared player has posted up, while the post screens to get the top man (2) open. Both "open", and top flare situations will be discussed in greater detail later.